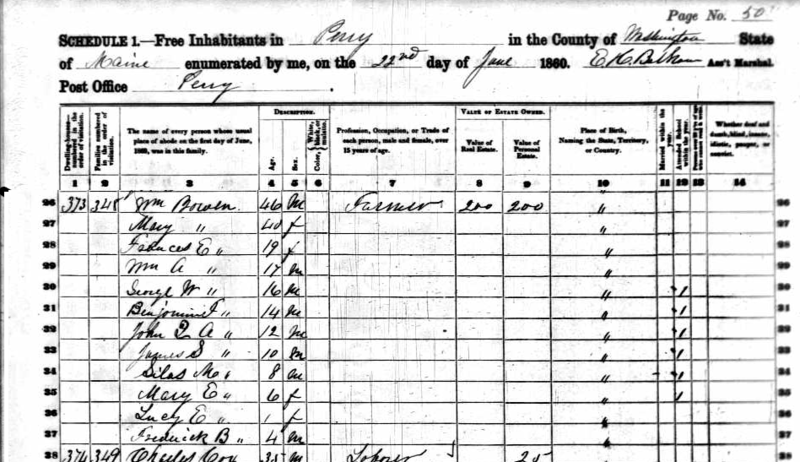 At the start of the Civil War, William and Mary (Boynton) Bowen lived on their small farm in Perry, Maine with 10 children, including my 2nd great grandfather, Frederic Lowell Bowen (age 4). By the end of 1864, she has lost her husband, 3 sons and a son-in-law to the war effort. Her eldest son William Alonso had also died, but not in the war as far as is known. In November 1861, William and son George Washington Bowen enlist with the Maine 1st Light Artillery Battery. They are initially stationed at Camp Chase, in Lowell, Massachusetts. In February 1862, George leaves with the unit for New Orleans but William, too sick to travel, remains in Lowell and dies on March 17th. Death of the Last Occupant of Camp Chase. When the soldiers evacuated Camp Chase, they left behind a man named William Bowen, who was confined to the hospital in consequence of an abscess. He died on Monday last. He was about forty-five years of age; it is understood he enlisted at Eastport, ME., and he leaves a family, and also parents probably in that vicinity. His body was buried by Mr. A.P. Lesure, undertaker, of this city, with whom his friends can communicate, should they wish to take any action in relation to the removal of his remains. Maine papers will confer a favor upon his relatives by publishing a notice of his death. A cousin, Jeanne O’Shea, and I have tried to find where William was buried in Lowell, but the 1862 book is missing from the cemetery where they likely buried him. He is probably in the unmarked section as it’s doubtful that Mary had the money to bring his body home. Son George dies in Baton Rouge, LA just 18 months later, on 14 Sep 1863 and is buried in Baton Rouge National Cemetery. 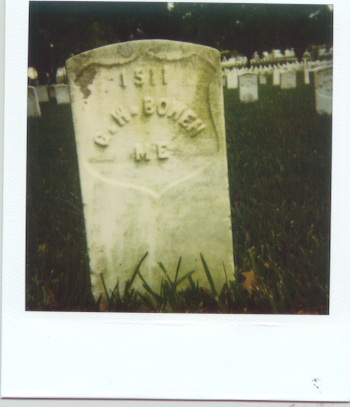 Son Benjamin Franklin Bowen enlists with the District of Columbia Cavalry on 13 Jan 1864 and dies 6 months later, on 27 Jun 1864, killed in a skirmish at Roanoke Station Virginia. Son John Quincy Adams Bowen enlists with Company D, Maine 2nd Cavalry Regiment on 8 Dec 1863. 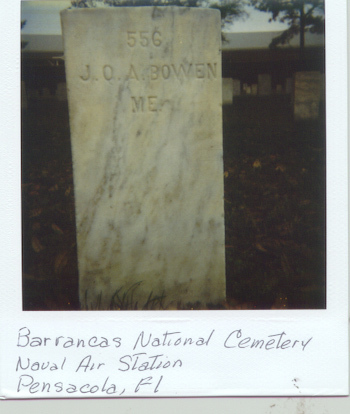 John dies of tuberculosis 21 Oct 1864 in Barrancas, FL (near Pensacola). I’m not sure who the other son is that she mentions is in Company E, 17th Maine. She does have 2 other sons that could have been there, but they are not listed in the roster of the 17th. The son-in-law she mentions is Samuel Collier, husband of eldest daughter Frances Ellen. Samuel enlisted with Company K, 18th Maine Infantry on 21 Aug 1862. The 18th is an interesting story, they spent most of the war stationed around Washington DC, guarding the capitol. In January 1863 the regiment designation was changed to the First Maine Heavy Artillery. In the spring of 1864, they were called to the front lines for Grant’s push into Richmond and saw some of the worst casualties of the war over the next year. Samuel died at Spottsylvania, VA 19 May 1864, the first day that his unit saw fighting. For an excellent writeup of this unit, check out Andrew MacIsaac’s history thesis “Here the Reaper was the Angel of Death: The First Maine Heavy Artillery During the Overland Campaign” posted here. 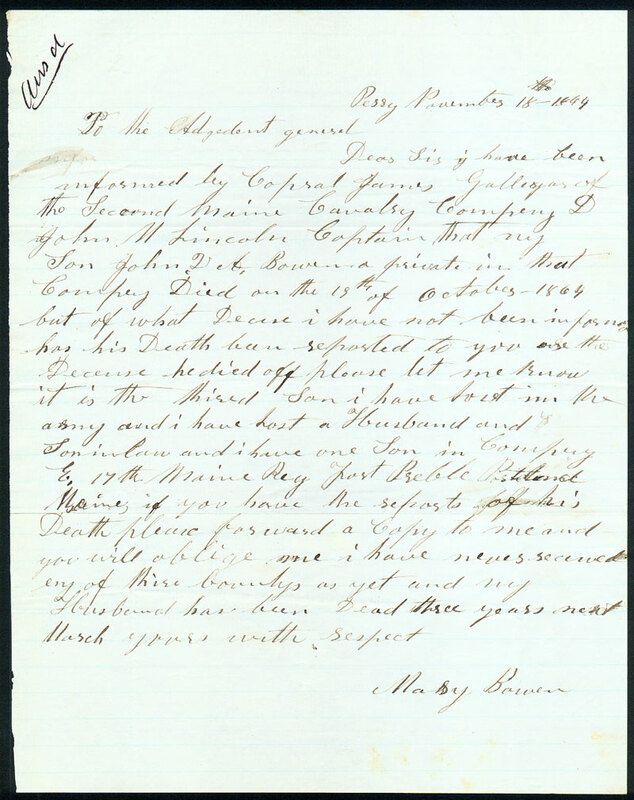 This entry was posted in Bowen, Civil War and tagged bowen, civil war, genealogy, maine by dave. Bookmark the permalink. Such heartache for a mom and wife. We really have no reason to complain about anything. These stories really bring to life the realities of war. I’m so excited to read this post! I am a direct descendant of William Bowen, too. Would love to get in touch, especially if I may pick your brain about the Bowen Family.